What could say "this is my room" better than a coat rack carved from solid maple wood in your child's first name? The 3-D letters are a bright and colorful reminder to hang things up too. Specify primary, or pastel colors. Number of pegs vary depending on length of name,4 pegs for names with 6 letters or less, 5 to 6 pegs for names with 7 to 12 letters. 16" to 19.5" wide depending on the length of the name. Gift wrap not available for this item. the personalization and versatility of the coat rack. And having a choice of color tones is an added bonus. Workmanship is excellent, obviously made with care. Our grandson's parents loved it, and he will too once he sees his coats on it! 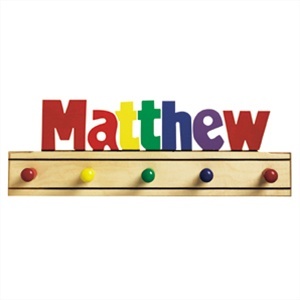 This personalized coat rack had become my go to gift for any baby gift I need to purchase. Every single recipient loves it, which makes me happy.